Carnival Panorama‘s California debut is now less than a year away, and the ship’s exterior completion was celebrated at the Fincantieri shipyard in Marghera, Italy with a traditional coin ceremony. A commemorative coin was welded to the ship’s mast in the time-honored maritime tradition, and Carnival released a video on the coin’s journey across the Golden State before winding up at the shipyard, which you can watch below. Maritime coin ceremonies can be traced back to the ancient Romans who believed that attaching coins to a ship provided divine protection. In modern times, the coin signifies the completion of a vessel’s exterior outfitting. Benoit Clement, Carnival’s senior VP of newbuilds represented Carnival at the ceremony with Antonella Cazzin, an over-35 year employee of Fincantieri who served as godmother for the event. 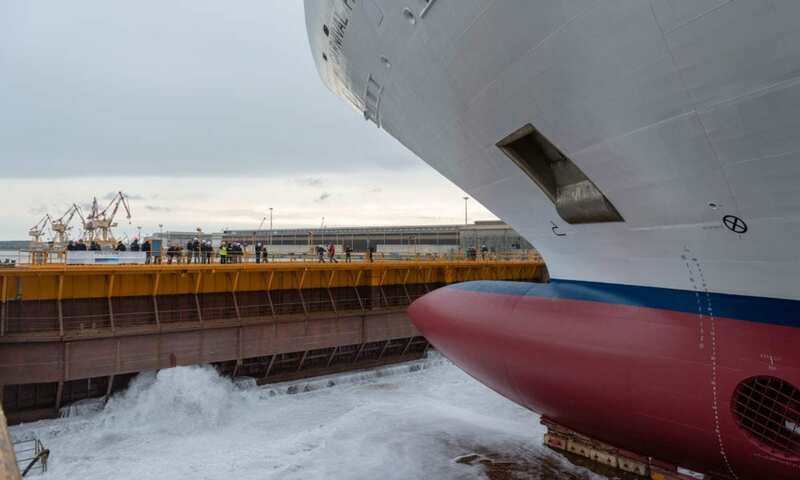 The 133,500 ton ship is the third in the Vista class and is set to debut in Long Beach on December 11, 2019 with a special 3 day voyage before launching year-round Mexican Riviera cruises beginning December 14, 2019.